Julian Price and Pat Whalen recognized that to attract people to Asheville, they needed to invest in entrepreneurs with great ideas. They tackled revving up a tepid restaurant scene, urging the creators of a tiny vegetarian lunch counter at the YMCA to think bigger. 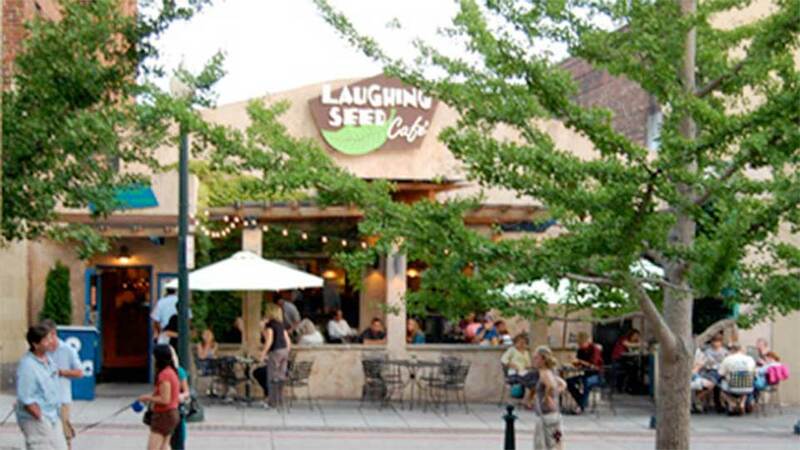 The result was the prize-winning Laughing Seed. 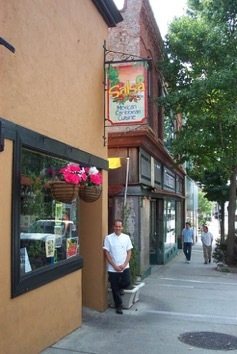 And when they noticed lines at a small window counter, they backed what became Salsa’s and eventually Zambra. Brains needed nourishment too, and so Price’s Public Interest Projects supported Malaprop’s move into the Asheville Hotel’s ground floor, securing the independent bookstore’s place as a cultural icon and sustainable business. And although Price was no rock and roller, he agreed with Whalen that a hip music venue would be a draw. 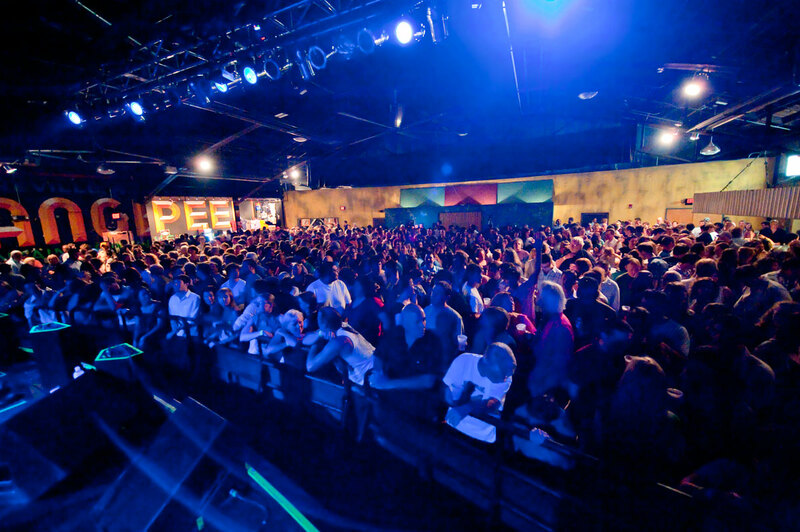 The outcome: the Orange Peel, named one of the nation’s top five rock clubs by Rolling Stone. Asheville also needed to get connected, so Price and Whalen backed NewEraCom, now Skyrunner, to create the area’s first wireless Internet provider, a step that improved the ability to do business in Asheville. The pair knew too that as streets filled with feet, people would want places to spend their dollars, leading to the restoration of the Grove Arcade building, downtown’s art deco architectural prize. 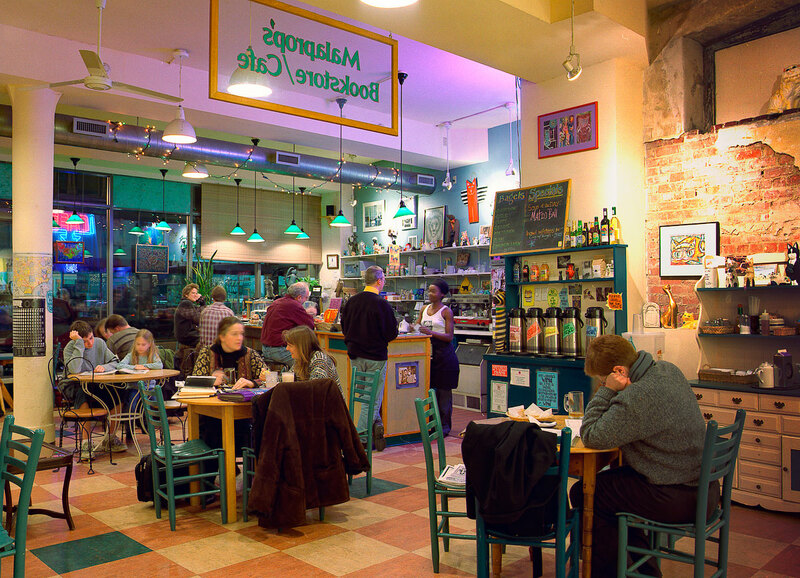 Backing businesses — from restaurants to arts and technology — returned the bustle to Asheville. What kinds of businesses create a town where people want to live? What businesses spawn meaty jobs that make people stay and shop and play, instead of car-hopping from mall to mall? When Julian Price, a forward-thinking activist, and J. Patrick Whalen, an attorney and businessman, founded Public Interest Projects (PIP) in 1991, they knew that Asheville, North Carolina, needed to draw people to shop, work, play and live. Soon they hired Karen Ramshaw whom Julian had met while helping fund a Planned Parenthood project. Together the three encouraged the good businesses that were already downtown and supported new businesses that would make downtown living irresistible. Hunger is a drive that trumps even sleep. So perhaps it’s not surprising that one of the first businesses Price funded began as a small vegetarian lunch counter in the basement of the Woodfin YMCA. Joan Cliney-Eckert had borrowed $10,000 from her mother in ‘91 to start the spot. It caught on immediately, and Julian Price became a tempeh-sandwich regular. “One day, Julian asked if I had thought about expanding,” says Cliney-Eckert. “He said, ‘I’ll send my lawyer [Pat Whalen] to talk to you.’” Cliney-Eckert’s then husband, Joe Eckert found Price’s interest “fishy,” says Cliney-Eckert. When Whalen showed up, explaining that Price wanted to lend them money, the Eckerts listened politely but did nothing. The Laughing Seed patio. Photo: Courtesy of Laughing Seed Cafe. Since its inception, the restaurant has been named Best Vegetarian Restaurant in WNC by The Asheville Citizen Times and The Mountain Xpress and covered by national publications, including The New York Times, Southern Living, and Vegetarian Times. One terrific restaurant, of course, was not enough to seed the foodie fantasyland that Asheville has become. 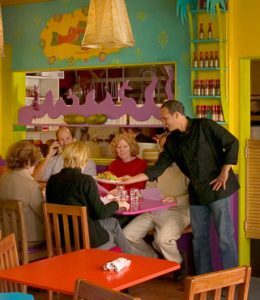 In 1994, a chef named Hector Diaz was running Salsa’s, a tiny spot on Patton. “A lot of people lined up because the food was incredible,” says Ramshaw. Diaz wanted to expand but could not get a traditional loan, so PIP stepped up. PIP also rented Diaz space for a second restaurant, Zambra, in 1995. But its identity remained blurry. A frustrated Diaz moved on, and PIP found itself running a restaurant. What followed was a series of chefs and managers–and a middling result. But in 2004, Peter Slamp arrived as assistant manager, and in 2005, Adam Bannasch came on as a line cook. “We saw almost an immediate change in our numbers,” says Slamp. 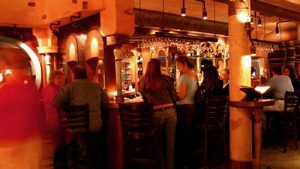 In 2011, Travel & Leisure named Zambra one of America’s most romantic restaurants and in 2015, USA Today named it one of Asheville’s 10 Best Places to Eat. In 1995, rumors flew that Barnes and Noble was arriving in Asheville, hearsay that made staff at Malaprop’s Bookstore/Cafe blanch. The shop–a downtown icon in a tiny space on Haywood since 1982– was perpetually crammed with books and customers. In-store offices, except for the bookkeeper, didn’t exist. Jane Voorhees, the store’s manager in ‘95 and a store employee for 15 years, held one-on-one meetings by the mailbox just outside Malaprop’s door. B’Racz agreed to look at the space: “It was in shambles. No one had been in it for years but pigeons and tiny creatures.” But she could imagine Malaprop’s there. For Price and Whalen, the bookstore was essential to downtown appeal. So, they offered a rent that would drop in slow times and rise in flush ones. B’Racz and her colleagues agreed to move, but hurdles remained. When B’Racz applied for a bank loan to pay for fixtures and increased inventory, the bank nixed the loan. “Banks don’t like bookstores,” says B’Racz, who responded by closing her bank accounts. B’Racz wrote to longtime customers asking for money. Some sent short-term loans and others prepaid their accounts for the coming year. If they had paid $600 the previous year, for instance, some paid that in advance for the coming year, explains Voorhees. Within a week, customers had loaned B’Racz thousands of dollars. For the move itself, customers formed a human chain to relay the books from the original store to its new space a half block away. In the mid-90s, Asheville computer access was dial-up only. But in 1997, Don Davis, then the owner of NewEraCom Technologies, a computer repair and installation business on Ravenscroft Drive, created the area’s first wireless link for Mountain Area Information Network. “I thought, ‘There’s opportunity here,’” says a chuckling Davis, now the majority owner and president of Skyrunner, a wireless Internet provider. Soon, Davis installed wireless for PIP, impressing Whalen and Price, “even though, technically speaking, Julian was a Luddite,” says Davis. Whalen suggested that Davis open a second company focused on wireless and began recruiting the company’s eventual underpinnings, Jane Hatley and Eleanor Ashton, then owners of Business Works, a marketing consulting company. Whalen hired Hatley as CEO and Ashton as director of marketing. Davis became president and chief technical officer. 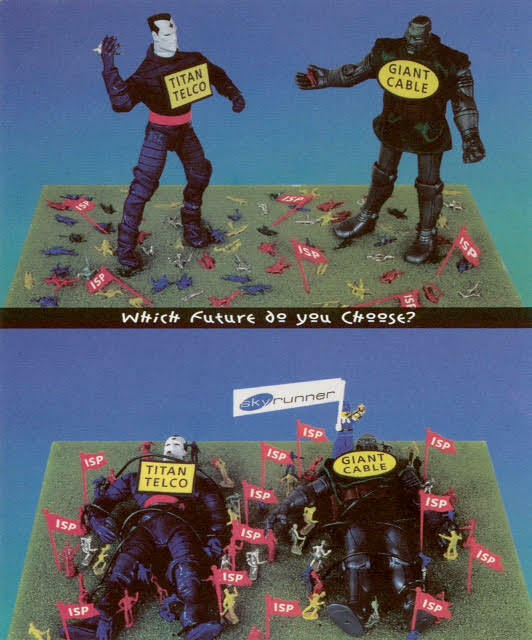 The new company name was Skyrunner, a play on Roadrunner, a popular Internet Company launched by Time Warner Cable in 1995. Guerrilla marketing for Skyrunner. Photo (and marketing): Courtesy of Public Interest Projects, Inc. In 1999, along came a dot.com prince, a Colorado venture capital start-up, Nupremis. “They saw us as a small tool to put in their pockets,” says Davis. Nupremis offered to buy Skyrunner for about $1.3 million and agreed to hire Davis and Hatley at double their salaries plus stock options. “We were going to be millionaires,” says Hatley. But in 2000, the dot.com bubble burst. A limping Nupremis sold Skyrunner back to Davis for $45,000 dollars. Today, the company services 3000 customers in Western North Carolina and part of South Carolina, its growth a key part of Price’s and Whalen’s legacy. In 1998, Be Here Now, a 235-seat music club, died and Asheville’s downtown club scene went silent. Whalen, a music lover, knew a music club large enough to draw national acts had to be on PIP’s wish list. Price trusted Whalen even though music clubs weren’t his passion. With Price’s understated blessing, Whalen began to hunt for a building. A boarded-up auto parts warehouse on Biltmore had had as many lives as a cat–as a National Guard armory, a roller skating rink, a rhythm and blues nightclub called The Orange Peel, and finally the warehouse still sheathed in shag carpet and a dropped nine-foot ceiling. But Whalen saw its potential: above the ceiling tiles lay impressive barrel vault steel trusses which allowed the room to be clear of columns, providing great sight lines from anywhere in the room. PIP leased the building and began renovations, turning it into a club with room for 950 on-their-feet music fans. Whalen also hired Jack and Leslie Groetsch formerly of Howling Wolf, a top-rated music venue in New Orleans, as the first managers. “The couple was instrumental in thinking through things like equipment and layout,” says Liz Whalen Tallent, the Orange Peel’s marketing and special events manager since 2006. In a nod to New Orleans, the Groetsches rechristened the space The Orange Peel Social Aid and Pleasure Club, also paying respect to the old club name, remembered by many long-time residents. Whalen was now running the music venue, recruiting six managers, each with a different expertise. “When Pat hired me in 2007, he was working at the club from 10 a.m. to 2 a.m.,” says operations manager Justin Ferraby. The new young management team was determined to earn Whalen’s trust. The turning point came in May 2007 when the Smashing Pumpkins, one of the ‘90s most successful alternative rock bands, agreed to a nine-day residency. “It put us on the musical map,” says Ferraby. PIP now shares profits with managers through annual bonuses, says Melissa Buerckholtz, a PIP accountant who oversees the Orange Peel books. The club sells 110,000 tickets a year–and half of its patrons are out-of-towners who also empty their wallets on lodging and food. 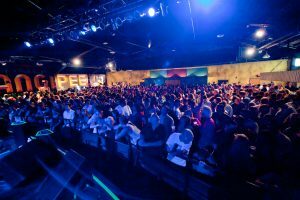 The Orange Peel was named one of the top 10 music clubs in the United States by Rolling Stone and by Pollstar. In the 1920s, E.W. Grove, a patent-medicine mogul, hired architect Charlie Parker to build the 269,000 square-foot Grove Arcade. Grove wanted “ladies” to pass the day shopping without blistering their feet walking all over town. Opened in 1929, the Arcade bustled with 74 food, book and clothing shops and 127 offices. But in 1942, World War II prompted the Federal Government to seize the space and cover its elegant windows with bricks. Eventually the Arcade became home to the National Climatic Data Center (NCDC). By the mid-80s, citizens wanted the Arcade back, worried that the government’s upcoming renovation would fatally alter the building. Mayor Larry McDevitt formed The Mayor’s Committee to Revitalize the Grove Arcade. Karen Tessier, active in downtown organizations, became the committee’s secretary. “Between 1985 and 1992, the committee’s goal was to get the Arcade back,” says Karen Tessier, now owner and president of Market Connections, an Asheville-based advertising firm. Part of the task was to make sure that NCDC had another place to go. “The Center was a hotbed of working people in downtown,” says Tessier. “Their jobs were vital.” In 1995, the NCDC moved into the new Veach-Baley Federal Building one block from the Grove Arcade. The committee also had to find a developer. “We had lots of false starts because the cost was huge and Asheville was dead,” says Tessier. Finally, architect Terry Shook, FAIA, a founding partner and principal of Shook Kelley, a design firm in Charlotte and Los Angeles, drew up plans that ultimately convinced the Federal Government to release the building’s deed to the city for $1. Now, what to do with the Arcade? Tessier spoke with Price about the dilemma during lunch at Stone Soup, once on Wall Street. As usual, Price got active: In September, 1992, Price; Meg MacLeod, Price’s future wife; and Tessier flew to Seattle to meet Aaron Pohl-Zaretsky, a director of Preservation and Development for the Pike Place Preservation and Development Authority. But no local banks were willing to invest in the project without an amount equal to the investment deposited in cash or other securities. Investors still saw downtown real estate as risky. PIP continued architectural and engineering work for the project and found a way to work around the banks’ reluctance, but still needed some buy-in from the federal government and the City. When the City decided it could not guarantee additional parking, PIP withdrew from the project, but not before donating another $250,000 to the Foundation with this stipulation: no space would be leased to chains or compete with businesses housed within 1000 feet of the arcade. Although the project was not completed as originally envisioned, after a $40 million renovation, the Arcade was reopened to the public in 2002– one of the city’s architectural jewels restored in part because of Price’s involvement. Price’s and PIP’s business investments weren’t all as deep and dramatic as the investments showcased here. Nonetheless each–the Fine Arts Theatre on Biltmore; Mobilia, a contemporary furniture store on Haywood; Blue Moon (now City) Bakery; The Marketplace Restaurant; Laurey’s Catering (now 67 Biltmore Cafe); the French Broad Co-op; and Jack of the Woods– were intended to and did become important parts of downtown’s appeal.